Check out our competitive Deposit and Certificate Rates, Effective April 24, 2019. Annual Percentage Yield. To maintain the stated premium APY, the following requirements must be met within 60 days of certificate opening: (1) open a checking account (2) set-up direct deposit of social security benefits or payroll funds (3) enroll in online banking (4) sign-up for E-statements. If all requirements are not met by 60th day yield will convert to standard 1 year APY of 1.50%. The minimum balance to open and earn APY is $500 and may not consist of money already on deposit. A penalty will be imposed for early withdrawal. APY effective April 24, 2019 and is subject to change at any time. 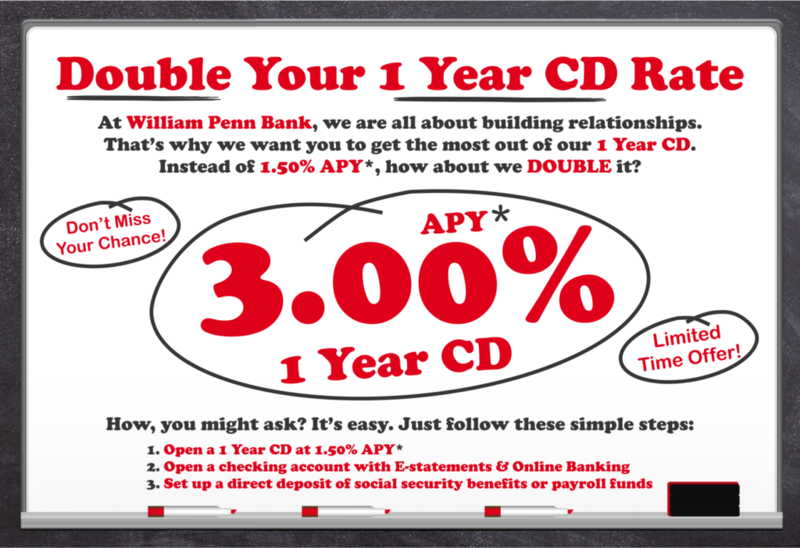 This account will automatically renew for a 1 year term at the then current APY. Annual Percentage Yield. To obtain the stated APY, a $500 minimum balance is required. A penalty will be imposed for early withdrawal. There is a ten calendar day grace period at maturity. APY effective April 24, 2019 and is subject to change at any time. (1) This account will automatically renew to a 6 month term at the then current rate/APY*. (2) This account will automatically renew to a 12 month term at the then current rate/APY*. (3) This account will automatically renew to a 24 month term at the then current rate/APY*. IRA funds are subject to all relevant IRS rules and regulations. Consult with your tax advisor for additional information. ** Interest Rate and Annual Percentage Yield may vary after account is opened. Fees may reduce earnings. *** Pursuant to federal law, no more than six (6) withdrawals or transfers per monthly statement cycle to a third party or to your other accounts at William Penn Bank are permitted on these account types. This limit applies to check, draft, debit card, pre-authorized transfers, telephone transfers and William Penn Bank online banking transfers. However, this limit does not apply to withdrawals made in person or through ATMs or by mail. If you repeatedly exceed this limit, we may close your account or transfer your funds to an account that does not have these limits. Additional fees may be assessed. Refer to the Bank’s Fee Schedule. **** Penalty will be imposed for early withdrawal. + The maturity date of this club account is October 3rd; its term varies depending on when the account is opened. A $15.00 penalty will be imposed and account closed for early withdrawal, regardless of amount.